I’m looking for some good ideas for an app and was wondering what you would like to see as a new app? I am some what of a noob to CNC but I have been doing woodworking for quite awhile. What I would like to see is a way to add points to objects that I use image trace to import. It’s easy to delete points, but not add them to an imported image. Only other one that I can think of is the ability to use a V-carve bit, cove, or chamfer with out having to select V-Bit and worry about the Z axis. Mostly just random thoughts…Good luck to you. A gradient app. You can see an example here. A pecking app would be handy. Maybe a spacing tool, too. One that would allow you to use “phantom” lines or something to that affect that don’t get carved, but are used just for item placement. A nesting app. If you are making a bunch of the same things or have multiple objects, just an app that can arrange them in the most material saving efficient way. I will keep you informed when I’ve made some progress! 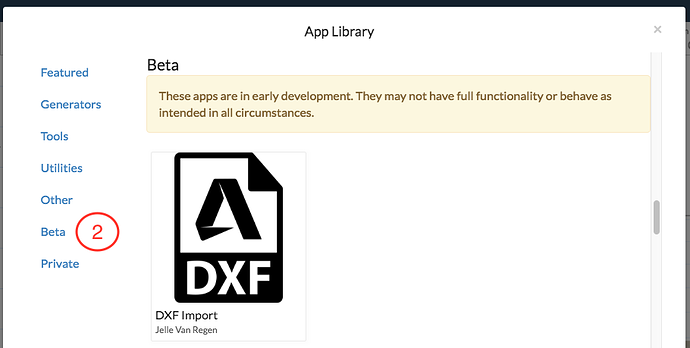 I’m working with inventables on the app and I’m ready to start testing some dxf files. I have tested some of mine and they all turn out great but to be more complete, I would like to test some of yours. If you have any, send me a private message and we’ll talk how to transfer them to me. I wold like to see some kind of wood joinery app. Like creating dovetails or boxjoints. I’m pleased to say that I have been working with inventables on the DXF to SVG app. It has been released today for beta testing. Two things you should know: DXF files should be encoded in ANSI 1252 (standard) and file size should be smaller than 2 MB. We are however looking into some ways to improve this. Please reply here if you run into some bugs or any other problems and try to be as specific as you can. It can be found in the “Beta” category in the App Library. Hi Ezequiel, it uploaded just fine, thank you. Could you also maybe upload and SVG of this file with your traditional method? (inkscape, online converder, AI, …). This way I can compare both SVG’s and see where they differ.